Context: Despite advances in surgical techniques for anterior cruciate ligament (ACL) repair, a significant proportion of patients encounter persisting pain/instability of the knee postoperatively. Objectives: To assess the location of femoral/tibial tunnels on magnetic resonance imaging (MRI) and to correlate the findings with the ACL graft integrity/graft-related complications. Study Design/Settings: This was a cross-sectional study done at Burjeel Medical Centre, Muscat, Oman. Materials and Methods: The study period was between November 2015 and June 2017 on Philips Ingenia 1.5 Tesla MRI machine. A total of 30 male patients, age ranged from 20 to 43 years who presented with knee pain/instability 1 year postreconstruction of ACL, were recruited for the study. Results: Of 30 cases, 10 (33.33%) patients had an intact graft on MRI. Of the remaining 20 patients, graft impingement was noted in 15 patients (50%), graft tear in 3 cases (10%), and graft stretching with abnormal high T2 signal in the remaining 2 cases (6.67%). 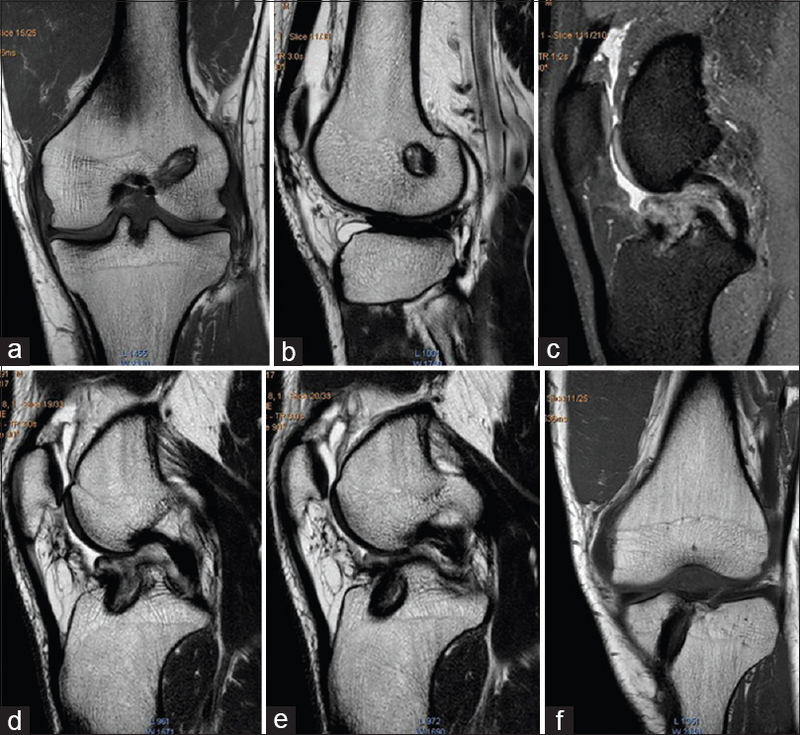 Associated findings of focal arthrofibrosis in the anterior knee joint space and tibial tunnel cysts were encountered in few patients who were not dealt with in this study. Out of 20 patients with graft abnormality, femoral tunnel was abnormally located in 3 (15%), tibial tunnel was located anterior to the MRI equivalent of Blumensaat's extension line partly or completely in 16(80%) and both tunnels were normally located in 1(5%). Conclusion: The location of the femoral/tibial tunnels is the most important determinant factor of postoperative graft integrity in ACL reconstruction patients. Anterior cruciate ligament (ACL) reconstruction is a commonly performed surgery in recent times. Two types of grafts are usually harvested, namely, the native bone-patellar tendon-bone graft and the autologous hamstring tendon graft., The correct positioning of the femoral and tibial tunnels is crucial for graft stability and good clinical outcomes. The femoral tunnel is important in maintaining graft geometry and is evaluated in both coronal and sagittal planes on magnetic resonance imaging (MRI). The tibial tunnel is best evaluated in sagittal images. As we routinely encounter patients who are symptomatic despite undergoing ACL reconstruction, this study was conducted to determine the underlying causes and to help surgeons avoid potential pitfalls, thereby reducing postoperative morbidity. To assess the location of tibial and femoral tunnels and their impact on the postoperative graft integrity/graft-related complications. The patients' age ranged from 20 to 43 years. A total of 30 patients who underwent arthroscopic reconstruction of ACL using bone-patellar tendon-bone graft/autologous hamstring graft were included in the study. They presented with various signs and symptoms, predominantly knee pain, instability, and incomplete extension. The study was conducted at Burjeel Medical Centre, Muscat city, Oman, between November 2015 and June 2017. The patients presented with ACL injury all sustained while playing football and subsequently underwent ACL reconstruction at various hospitals. Only patients presenting 1 year postsurgery were included in the study as neovascularization of the graft occurring within the initial 4–8 months may give a bright signal on short transposable element (TE) sequences, posing image interpretation challenges. Similarly, patients with neoplastic, metabolic, and infective pathologies of the knees were excluded from the study. The MRI procedure was performed on 1.5 Tesla Philips Ingenia scanner using a dedicated knee coil. Images acquired using standard sequences were coronal short tau inversion recovery (STIR)/T1-weighted (T1W), sagittal Proton Density Fat Saturated (PDFS), and sagittal/axial T2-weighted (T2W) images. The scan parameters adapted for the various sequences were T1W images (Repetition time (TR) of 500 ms, Echo time (TE) of 17 ms, and slice thickness of 3.5 mm), T2W (TR of 4100 ms, TE of 80 ms, and slice thickness of 2.0 mm), PDFS (TR of 3100 ms, TE of 30 ms, and slice thickness of 2.6 mm), and STIR (TR of 4300 ms, TE of 30 ms, and slice thickness of 3.5 mm). The images were reviewed, and the location of the femoral and tibial tunnels, graft characteristics, and graft-related complications were studied. A normal-thickness graft showing diffuse homogenous low-signal intensity on T2W/PDFS sequences was taken as an intact graft. Graft abnormality was considered if there were hyperintense signals in the graft, thickening, bowing of graft, or graft discontinuity. Statistical analysis was done by SPSS version 17 (SPSS Inc, Chicago State, USA). A total of 30 patients who underwent arthroscopic repair of ACL were included in the study. Of the 30 patients, 10 (33.33%) had an intact graft on MRI. Graft impingement was seen in 15 cases (50%), graft tear in 3 (10%), and graft stretching with abnormal high T2 signal in the remaining 2 cases (6.67%) [Table 1]. 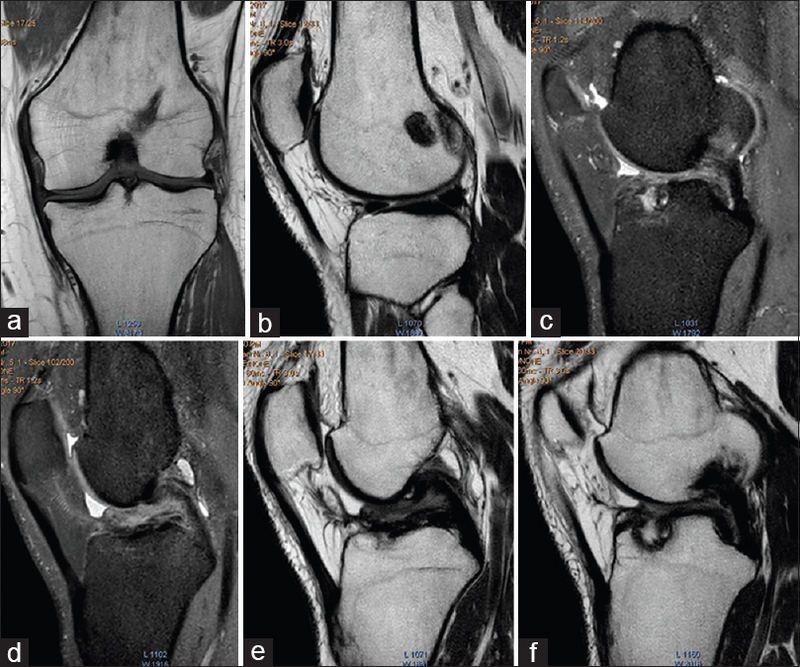 Three patients had associated focal arthrofibrosis in the anterior knee joint space and tibial tunnel cysts. All the patients with intact graft had normally oriented femoral and tibial tunnels. Of the 20 patients with graft-related complications, femoral tunnel was abnormally located in 3 (15%) and tibial tunnel was located anterior to the MRI equivalent of Blumensaat's extension line partly or completely in 16 patients (80%) [Table 2]. Postoperative evaluation of reconstructed ACL is best done by MRI, which accurately helps in diagnosing the integrity of the graft and its associated complications. In 2011, Galal et al. conducted a study on 48 patients to determine the MRI findings in complications following ACL reconstruction surgery and found MRI to be the most valuable imaging modality for postoperative evaluation of the knee. In our study, we tried to assess the percentage of graft integrity/complications and compare the location of femoral/tibial tunnels to the graft-related complications. According to literature, the location of femoral and tibial tunnels is by far the most important indicators of postoperative success/failure for ACL reconstruction surgery., The position of the femoral tunnel is critical in maintaining graft geometry and permits for a constant length and tension in the graft through the range of flexion and knee extension. The femoral tunnel if located anteriorly causes graft elongation and results in knee instability. The distal aspect of the femoral tunnel on sagittal images should lie at the intersection of a line through the posterior cortex of the femur and another line through the roof of intercondylar notch. On coronal images, the tunnel should lie at 10–11 o' clock in the right knee and 1–2 o' clock in the left knee., Tibial tunnel is the primary factor in preventing impingement against the intercondylar roof. The tibial tunnel should ideally be parallel to the Blumensaat's extension line which is a line drawn along the intercondylar roof. The distal portion of the tunnel should start near the tibial tuberosity, and it has to be entirely posterior to the line in its intra-articular portion., When the tunnel is anteriorly located, the graft is seen to be impinged by the femoral and tibial intercondylar portions and is subjected to strain and eventually undergoes degeneration and tear. This was already evaluated by few authors such as Meyer et al., and our study reaffirms the same. In our study, of 30 patients, 10 (33.3%) had intact grafts with no signal alterations [Figure 1] and [Figure 2], while 15 cases (50%) had graft impingement which was the most commonly encountered complication. Impingement was mainly against the intercondylar roof [Figure 3], [Figure 4], [Figure 5], [Figure 6], [Figure 7], [Figure 8]. Graft discontinuity/tear was seen in three cases (10%) [Figure 5] and graft stretching with abnormal high T2 signal in two patients (6.67%) [Figure 6]. The femoral and tibial tunnels were in the normal locations in all patients with intact grafts. The patients with intact grafts had other incidental pathologies involving meniscus/cartilage which were probably responsible for their pain but were not considered in our study. The tibial tunnel was seen anterior to the MRI equivalent of Blumensaat's extension line in 16 cases (80%) with graft complications and 3 cases had both abnormal femoral and tibial tunnels. This is in accordance with the study by Meyer et al. who stated that the normal location of tibial tunnel is the most important factor in preventing graft impingement. El Ameen et al., in 2014, studied the role of MRI in the evaluation of tibial tunnel on 34 patients and correlated their findings with the rate of ACL graft complication and found that the graft impingement was the most frequently encountered complication representing 54.1% and graft disruption was found in 16.7%. Tibial tunnel malposition was encountered in 75% patients. In agreement with their study, our study also shows that graft impingement is the most commonly encountered postoperative complication (50%) and tibial tunnel malposition was seen in 80% patients with graft-related complications. In 1992, Howell et al. studied 56 patients with ACL grafts, of which 30 cases had impingement. This is comparable to our study results. They observed that when the location of tibial tunnel is 22–28 mm from the anterior edge of the tibia (posterior to the Blumensaat's extension line), graft impingement can be prevented. Even though our study does not precisely measure the location of tibial tunnel, our results are in accordance with their study wherein we have observed that more posteriorly located tibial tunnels have a higher postoperative success rate. Tomzack et al. studied 45 patients 1 year after ACL reconstruction. A total of 20 patients with good tibial and femoral attachment results were found at clinical examination to have a stable knee joint with a full range of motion. In 25 patients with suboptimal placements, examination showed either a stable knee with a decreased range of motion or instability with a normal range of motion. According to their study, patients' clinical outcome and the radiographic/MRI findings correlated closely with the quality of operative tunnel placement, which reemphasizes our finding that the correct tunnel placement is of prime importance for optimal postoperative results. Galal et al. studied 48 postoperative patients of ACL reconstruction between 2006 and 2008 and found that graft tear was the most encountered complication in 70% patients and impingement was found in 25%, in contrast to our study where the later was more common. We encountered few cases of focal arthrofibrosis (cyclops lesion) in the Hoffa's fat pad , [Figure 1] and [Figure 8] and tibial tunnel cysts [Figure 7]. Hardware misplacement/loose bodies were not encountered in our study. Graft impingement is the most common postoperative complication following ACL reconstruction, and proper location of tibial and femoral tunnels is of paramount importance in preventing graft impingement and ensuring graft integrity. Wagner M, Kääb MJ, Schallock J, Haas NP, Weiler A. Hamstring tendon versus patellar tendon anterior cruciate ligament reconstruction using biodegradable interference fit fixation: A prospective matched-group analysis. Am J Sports Med 2005;33:1327-36. Freedman KB, D'Amato MJ, Nedeff DD, Kaz A, Bach BR Jr. Arthroscopic anterior cruciate ligament reconstruction: A metaanalysis comparing patellar tendon and hamstring tendon autografts. Am J Sports Med 2003;31:2-11. Recht MP, Kramer J. MR imaging of the postoperative knee: A pictorial essay. Radiographics 2002;22:765-74. 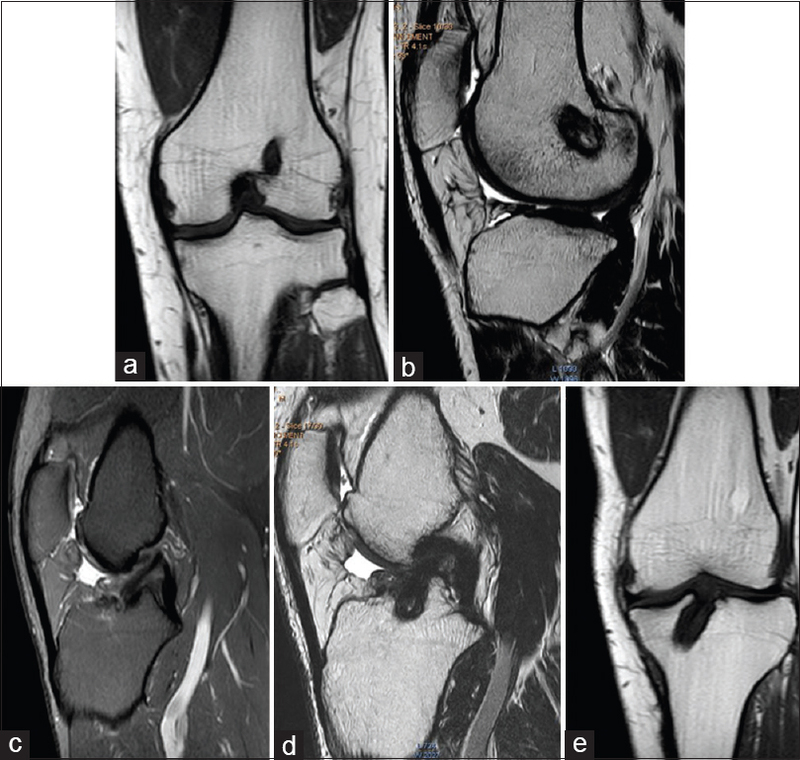 Galal A, Abdul-Maksoud S, Al-Kandary S, Abdul-Salam S, Awad A. Anterior cruciate ligament reconstruction: Magnetic resonance imaging and factors influencing outcome. Egypt J Radiol Nucl Med 2011;42:193-200. Howell SM, Clark JA. Tibial tunnel placement in anterior cruciate ligament reconstructions and graft impingement. Clin Orthop Relat Res 1992;(283):187-95. Tomczak RJ, Hehl G, Mergo PJ, Merkle E, Rieber A, Brambs HJ, et al. Tunnel placement in anterior cruciate ligament reconstruction: MRI analysis as an important factor in the radiological report. Skeletal Radiol 1997;26:409-13. Sanders TG. MR imaging of postoperative ligaments of the knee. Semin Musculoskelet Radiol 2002;6:19-33. Papakonstantinou O, Chung CB, Chanchairujira K, Resnick DL. Complications of anterior cruciate ligament reconstruction: MR imaging. Eur Radiol 2003;13:1106-17. 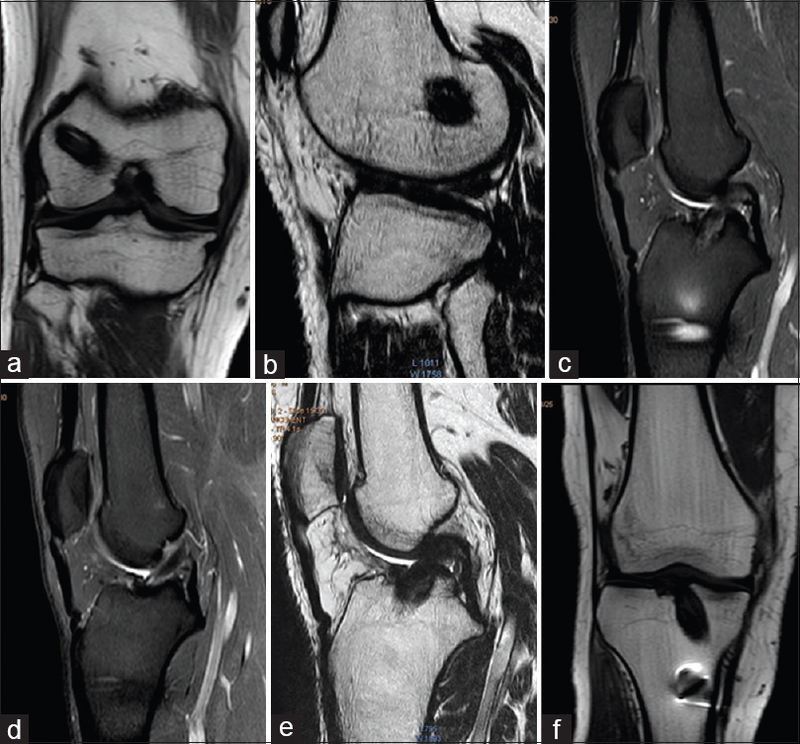 Meyers AB, Haims AH, Menn K, Moukaddam H. Imaging of anterior cruciate ligament repair and its complications. AJR Am J Roentgenol 2010;194:476-84. Jansson KA, Linko E, Sandelin J, Harilainen A. A prospective randomized study of patellar versus hamstring tendon autografts for anterior cruciate ligament reconstruction. Am J Sports Med 2003;31:12-8. Bencardino JT, Beltran J, Feldman MI, Rose DJ. MR imaging of complications of anterior cruciate ligament graft reconstruction. Radiographics 2009;29:2115-26. Kheder EM, Abd El-Bagi ME, El-Hosan MH. Anterior cruciate ligament graft tear. Primary and secondary magnetic resonance signs. Saudi Med J 2009;30:465-71. Saupe N, White LM, Chiavaras MM, Essue J, Weller I, Kunz M, et al. 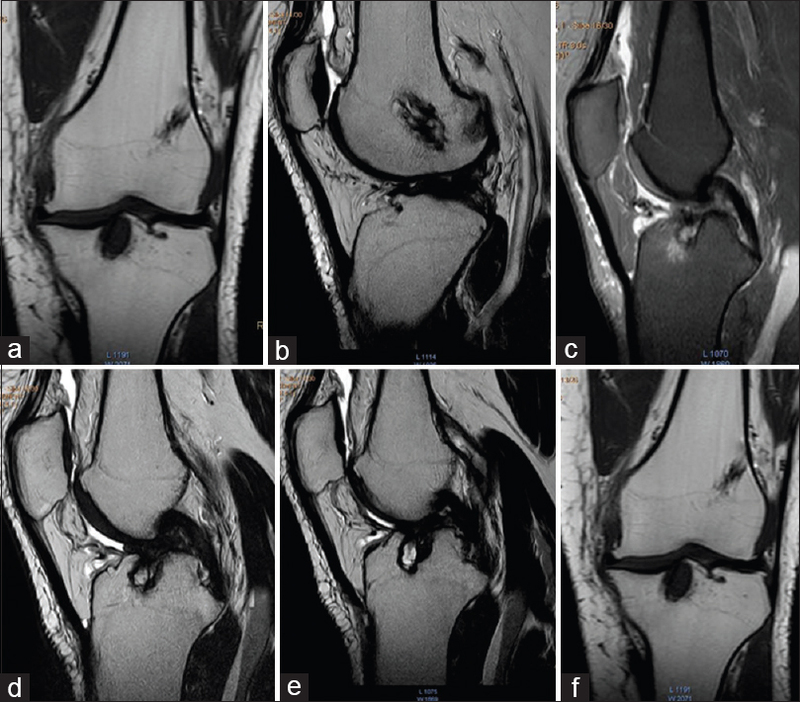 Anterior cruciate ligament reconstruction grafts: MR imaging features at long-term follow-up – Correlation with functional and clinical evaluation. Radiology 2008;249:581-90. 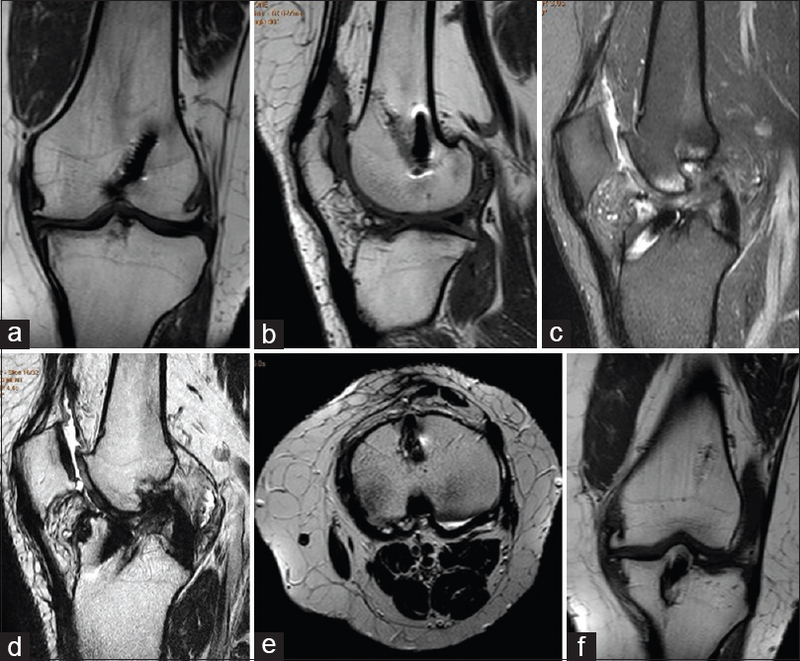 El Ameen NF, Ghany HS, Kader MG. MRI assessment of tibial tunnel and its relation to complication following arthroscopic reconstruction of anterior cruciate ligament. Egypt J Radiol Nucl Med 2014;45:811-7. White LM, Kramer J, Recht MP. 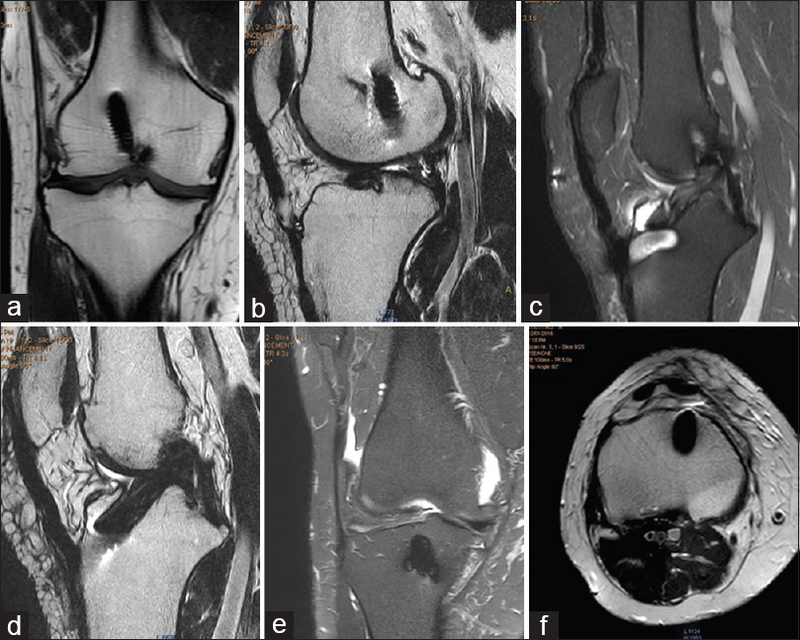 MR imaging evaluation of the postoperative knee: Ligaments, menisci, and articular cartilage. Skeletal Radiol 2005;34:431-52.